Summer in Japan is really hot and humid. Yet there is a cool way to refresh without air conditioning in Japan – enjoying kaidan (ghost stories). It sounds like a joke, but ghost stories seem to have a cooling effect scientifically. The mechanism is, people get tense when they feel fear, which causes the peripheral blood vessel to contract. It impedes the blood circulation. The body surface temperature goes down as a result. With or without this evidence, kaidan has been popular as summer-time entertainment since the old days. It may be partly because of bon, a Japanese buddhist custom in summer. During the bon period, it’s believed the ancestors’ spirits come back to this world. Actually lots of Japanese summer festivals such as tanabata, toro-nagashi and okuribi derive from or related to this belief. So people might feel the dead souls somewhat closer than other seasons. There is another view on the origin of kaidan as summer entertainment. In 1800s, a famous kabuki scriptwriter Tsuruya Nanboku IV wroted stories for natsu-kyogen (kabuki theatrical productions during summer) including a splendid play entitled “Tokaido Yotsuya Kaidan”. At that time, summer-time productions were played by young actors with lower price because the top actors took vacation. To attract the audience during summer, kaidan , which had been played in spring or autumn till then, was played with novel settings. It is said that kaidan was established as a Japanese summer tradition since then. For most Japanese people, the typical image of ghost is not like Casper but a sad, beautiful woman wearing a white kimono. When I was a kid, I truly believed that ghosts had no legs, but later I learned this was a creation of Maruyama Okyo, a famous artist in the past. 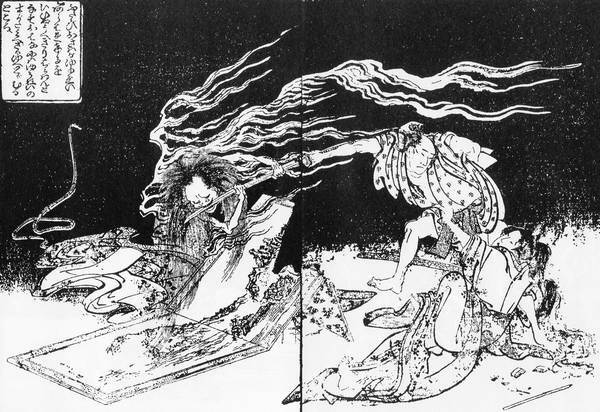 “Oyuki” by Maruyama Ôkyo (1733-1795) – Found at: http://eee.uci.edu/clients/sbklein/GHOSTS/html/edoghosts/pages/oyuki.html. Via Wikipedia. If you’re interested in appreciating the traditional ghost arts, it’s worth visiting Zenshoan temple in Yanaka, Tokyo in August. Every summer, they exhibit Encho‘s (famous rakugo storyteller in 1800s) collection of ghost paintings, one of the best of this kind in Japan.